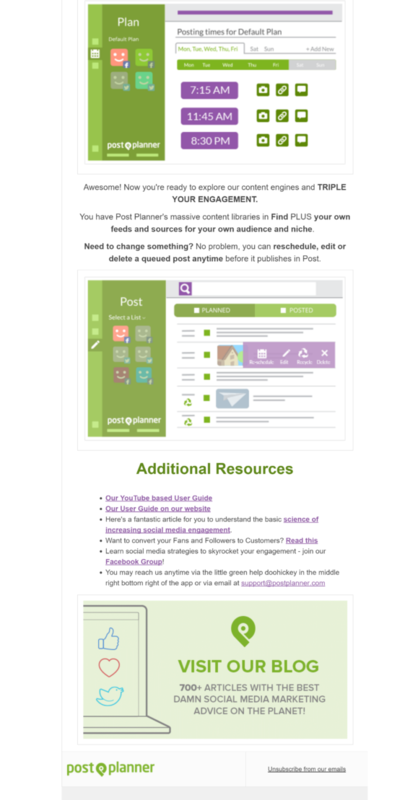 Are your subscribers getting the right message with your welcome emails? The first email you send is crucial in building your relationship with your audience, so it’s important to get it right. 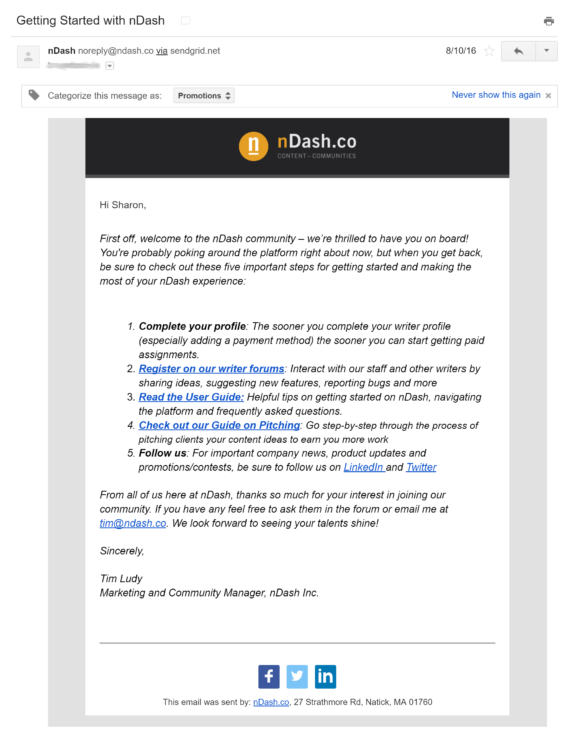 We’ve previously written about engaging email subscribers from the start, but in this article we’re going to look at where some companies are going right, or going wrong. 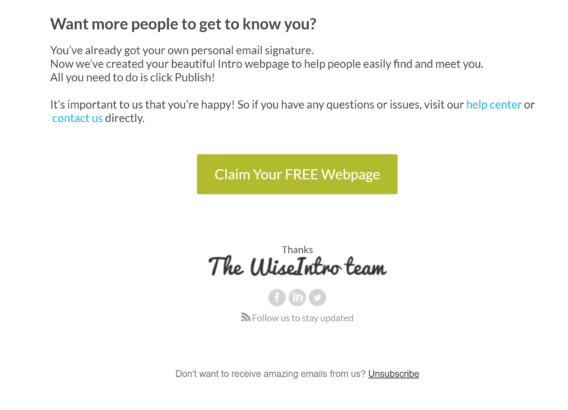 With these examples of welcome emails, you’ll be able to tweak your own welcome and onboarding strategies to give new email list subscribers a better experience. You’ll also learn some useful welcome email best practices to guide your own welcome email strategy. Before we dive in, let’s take a look at a few stats that tell us exactly why it’s so important to get your welcome email right. Did you know that welcome emails have the highest open rate of any emails you send to subscribers? 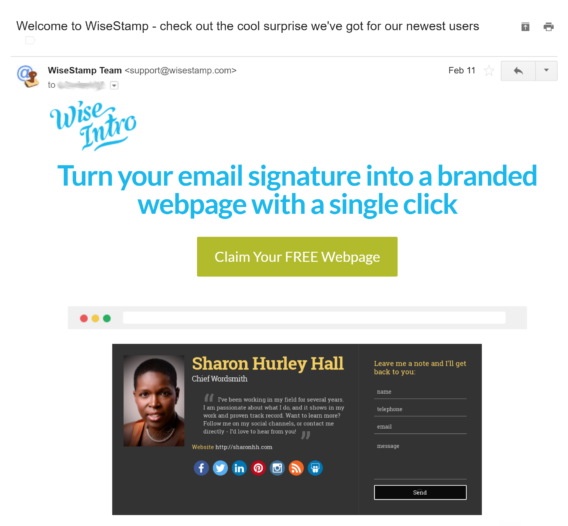 The open rate for welcome emails is a staggering 60%, according to Chief Marketer. Welcome emails are usually short: 65% of welcome emails range from 50-150 words in length. But a low word count doesn’t make them any less effective. Emails sent as part of the user onboarding process can help to boost app retention by 71%. That’s pretty impressive for a short email, isn’t it? So, how do different companies welcome new users? Let’s take a look at 14 examples that work. 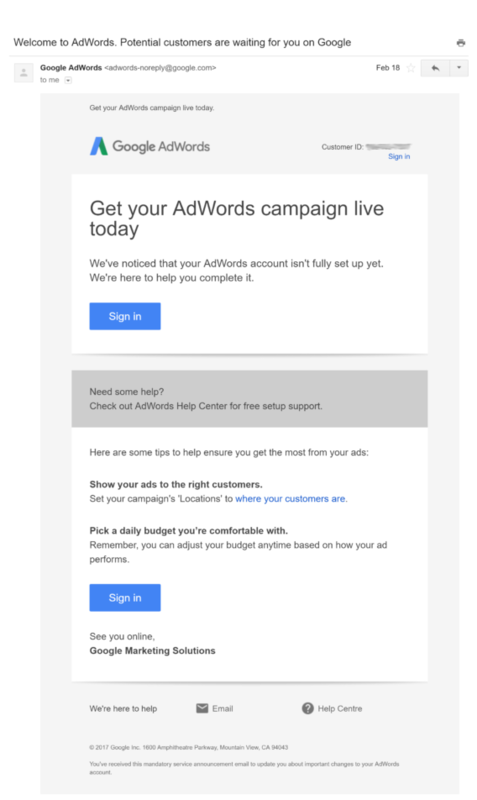 Google AdWords sends a couple of welcome emails, which seems to be overkill, if you ask us, but they do serve two different purposes. It’s short, making it easy for people to read it quickly. It gives the recipients some steps to follow. There’s a call to action (CTA). The subject line is bland. There’s no personalization, although Google almost certainly knows the recipient’s name. It’s too plain, looking like a wall of text at first glance. The no-reply email address means there’s no way for people to respond to the email. The subject line draws recipients in with a reference to a task they’ll all want to complete. The email is branded, inspiring trust. There’s a single CTA, repeated three times, to sign in and complete the account setup. 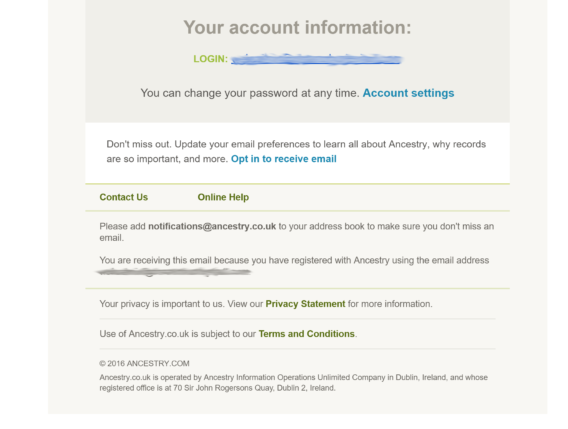 The color scheme leaves no doubt about who this Ancestry email is from. The email includes a clear list of steps to follow to get started with its services. The design also highlights the first step in a shaded box. There’s a clear CTA early in the email. The inclusion of a second, different CTA in the box below could be confusing, and could make recipients decide to do nothing. Repeating the signup information twice is unnecessary. 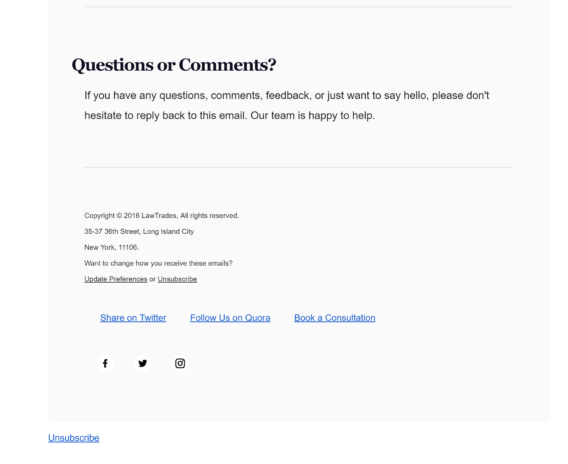 There’s no clear unsubscribe link, which opens them up to spam complaints. 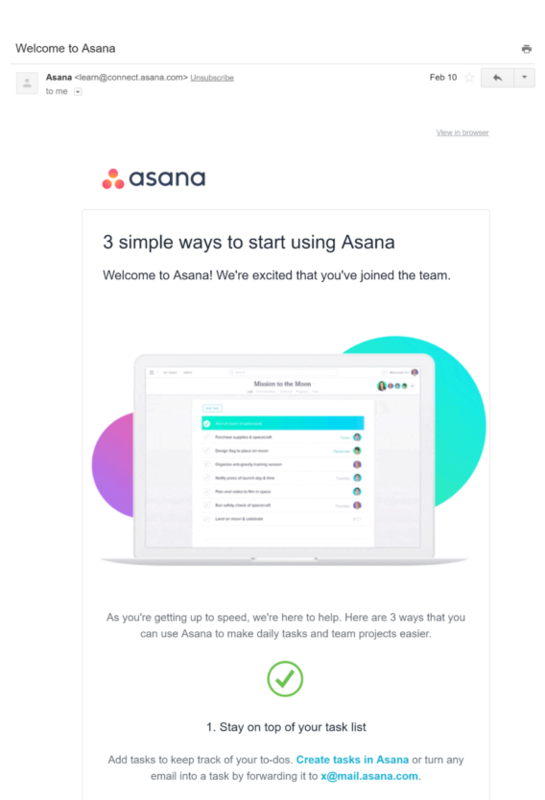 The design of this Asana welcome email splits it into panels, with each showing an icon and short description of an Asana function. 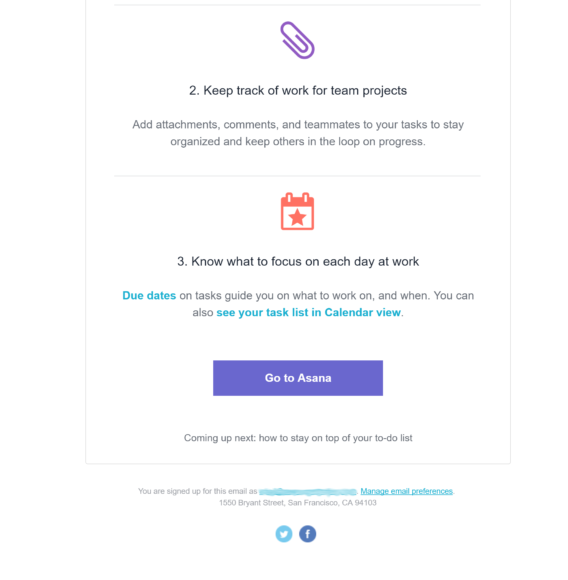 It looks like Asana, which is great for brand recognition and trust. There are links you can follow to complete different tasks in the app. The email would work even without the images. There’s a clear link to where subscribers can manage email preferences. We’re probably being picky here, but the CTA could have been nearer to top of the email. With the company’s logo right at the top of this welcome email, there’s no mistaking who it comes from. 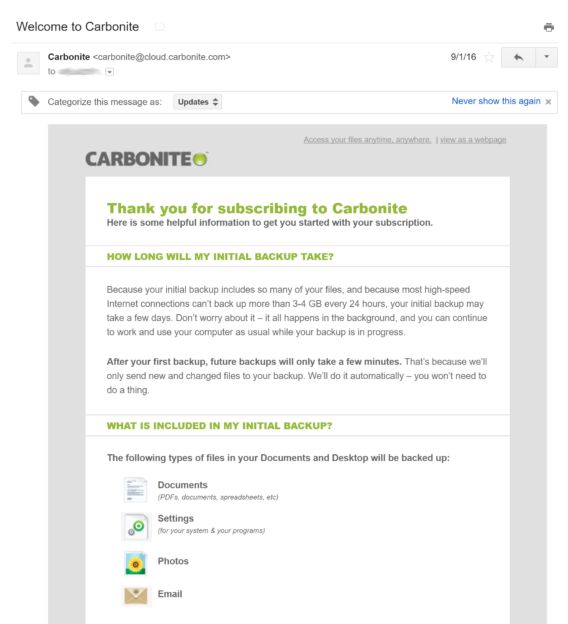 It answers two common questions people have about using Carbonite for backup. That’s pretty useful and will likely cut down on the number of support requests from new users. It includes social media links, which are a big trust factor. The icons help make the content easier to understand. The email is far too long. There is no CTA till you reach near the end of the email, which many people may not do. There’s no clear unsubscribe link, though there is a link where you can manage email communication preferences. 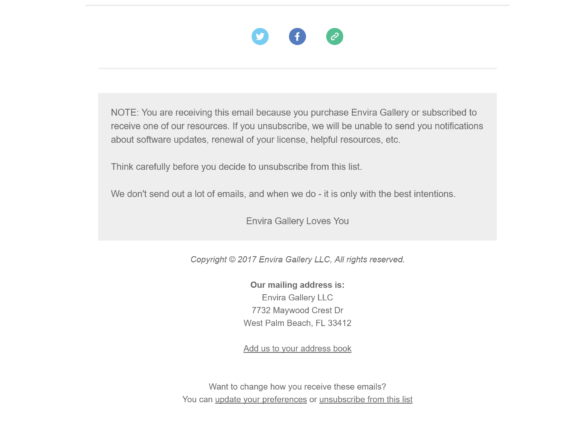 Let’s see how this welcome email from Envira Gallery stacks up. 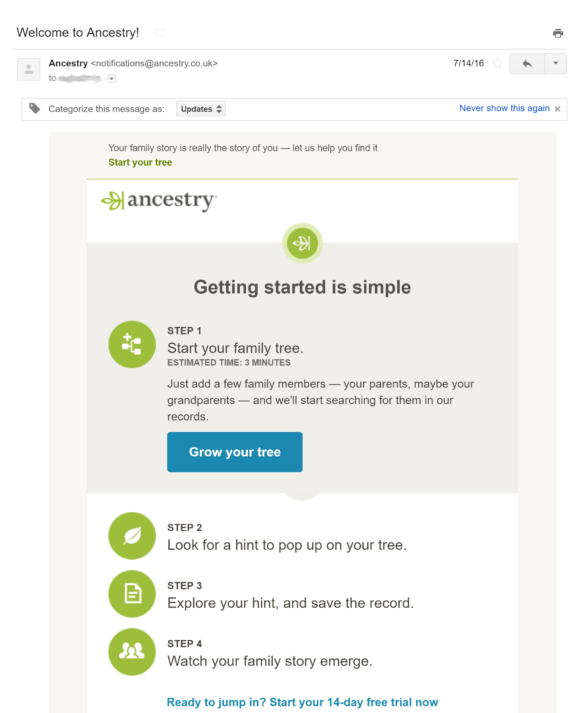 Personalization: the email addresses the recipient by name. The product logo is included for brand recognition. The copy has a friendly tone. There’s a visible unsubscribe link. It comes from a real person. We couldn’t find anything to dislike in this email. The social links are clearly visible, and there’s a callout box showing how people subscribed and why they should remain on the list. 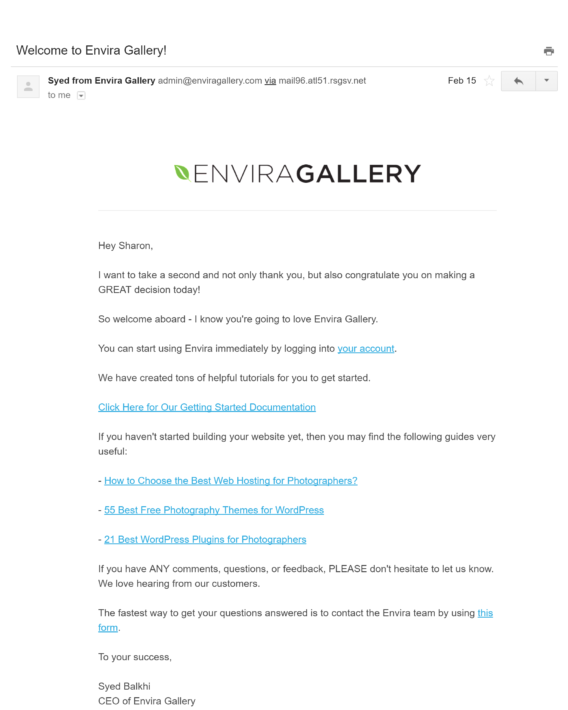 That’s why we think the Envira welcome email is an example of good practice. You get this email after you activate a GSuite account, and you’d hardly know this came from the same company as the AdWords email above. 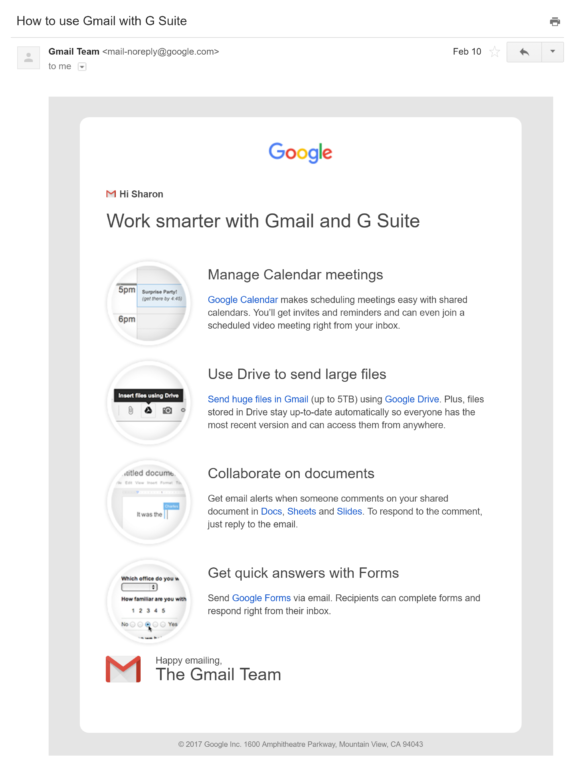 The email has clean, uncluttered design, in keeping with Google’s branding. There are short descriptions of four things you can do with GSuite, along with helpful links. The combination of text and icons makes it visually appealing, and they still work even if people have images turned off. The “no-reply” email address feels impersonal. There’s no unsubscribe link, but then, who’s likely to want to unsubscribe from their GSuite account? 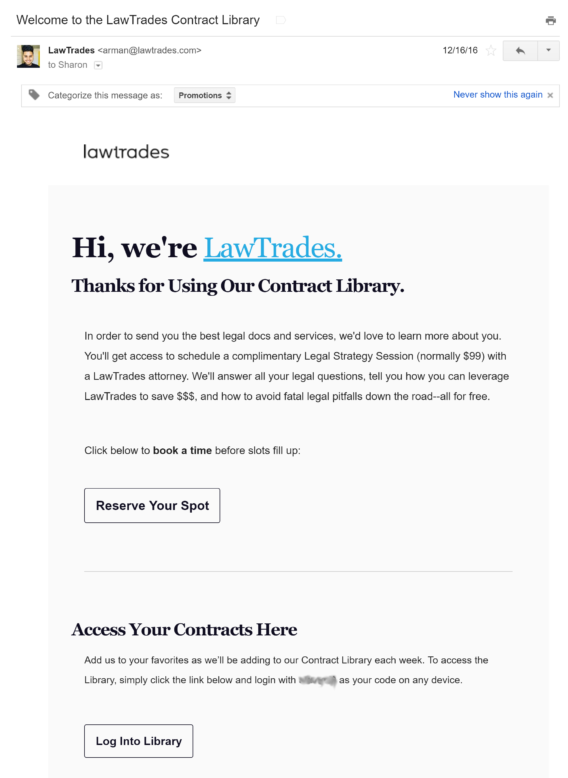 This welcome email from LawTrades came after signing up for a deal via a third party deals provider. The subject line tells you what you’ve signed up for. There’s a link to the company so you can check them out. This inspires trust. 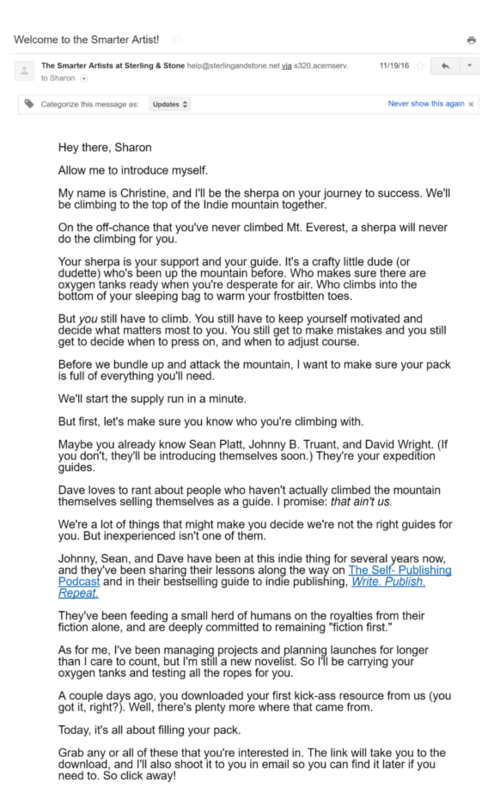 The clean, three-panel design makes the email easy to read, and the text is short. Social media links and address info are included. There’s a clear unsubscribe link. 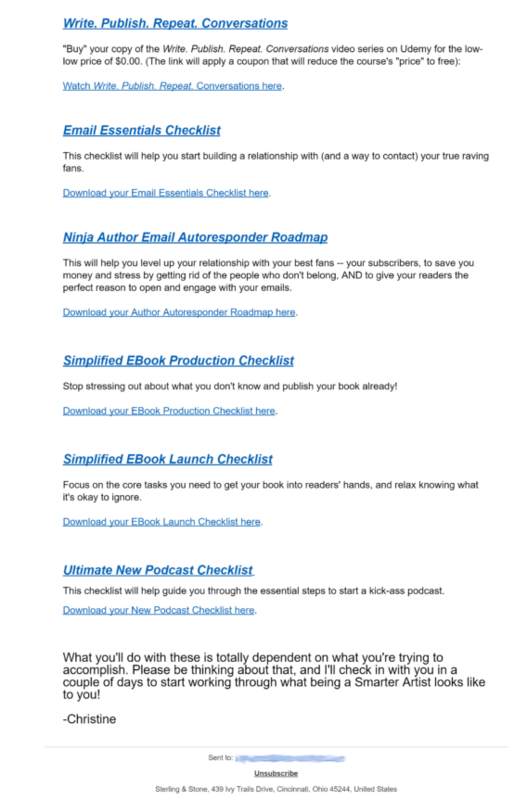 There are two different CTAs at the top of the email, and the second one is arguably more useful to new readers, so should be first. The early attempt to get people to book a strategy session feels rushed. Although there’s an image of the sender, he doesn’t sign the email. NDash takes a two-in-one approach, combining welcome and onboarding functions. One email does it all; helping people get started rather than sending two separate emails is a good approach. Social media links are there to build trust. There are multiple actions you can take next (which is also a problem, as you’ll soon see). 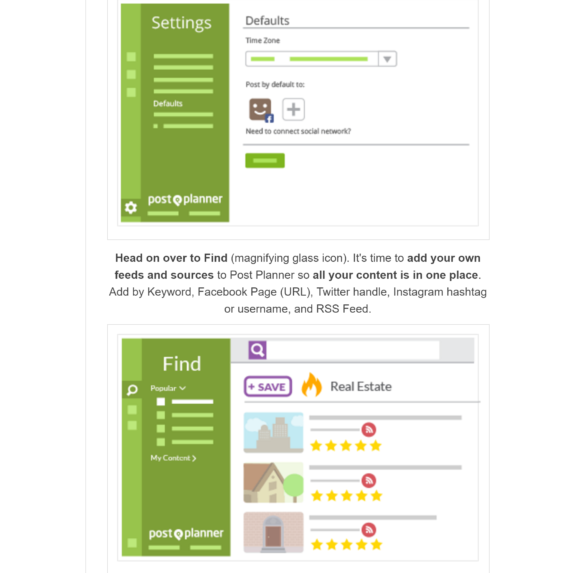 The one column template works for any device. It includes the logo and social links. It’s signed by a real person. There are too many actions to take from the email. The no-reply email address feels impersonal. The CTA is near the start. There are social media links. In our opinion, this email is way too long. With images not displayed, it’s a little more reasonable, but many email clients now display them by default. 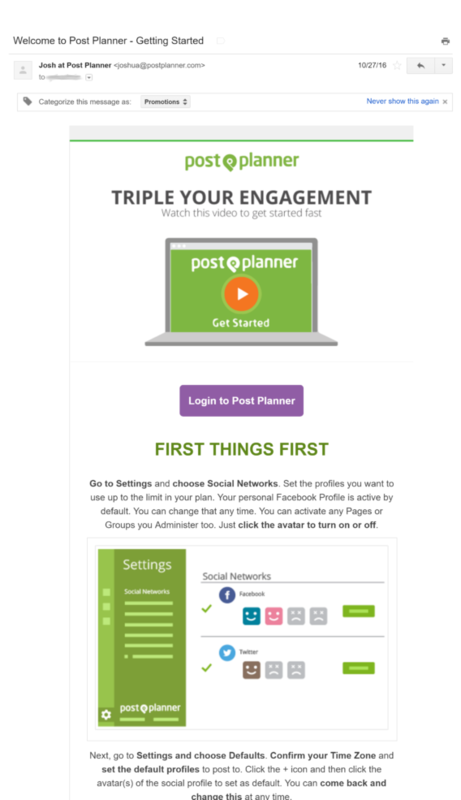 PostPlanner’s email is a complete walkthrough, and we wonder if this is the best way to do it. No doubt, they’ve tested and this is what converts well for them, but to us, it’s a bit too much. 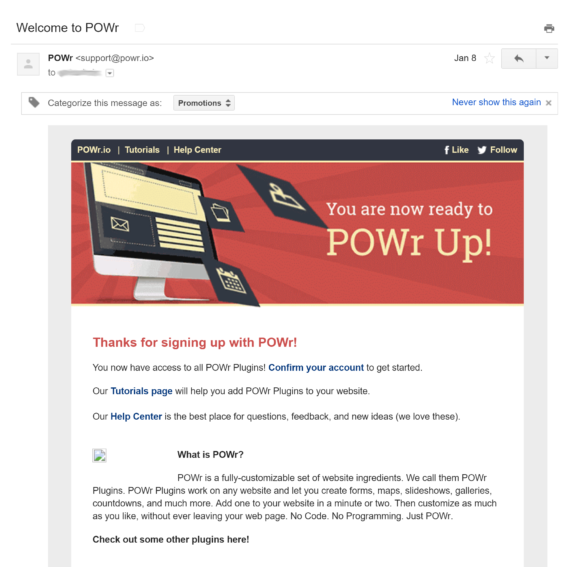 This email comes from WordPress plugin maker Powr. Links to some key areas are in the email header. Social media links are included. See that broken image icon? That probably means they were running a promotion at the time that has now ended. Anyone revisiting the email later won’t see a thing – and that’s not good. There are too many things to do and CTAs. It doesn’t come from a real person. 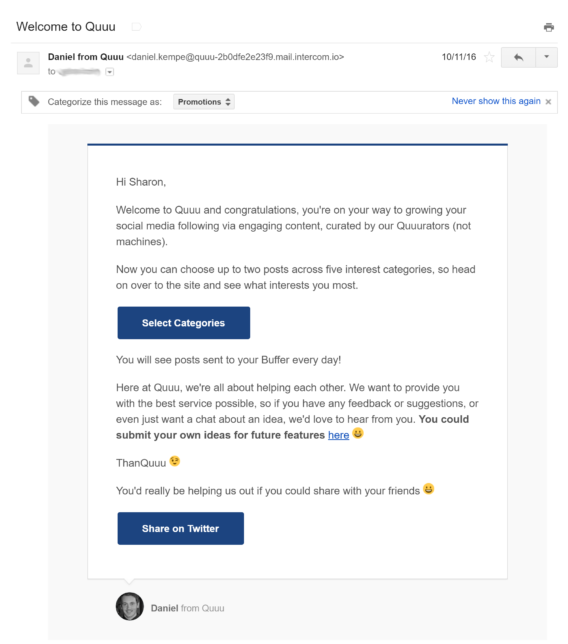 Quuu’s welcome email is a bit unusual. That’s because it comes via the Intercom communication system. This email is short, simple and easy to read. It comes from a real person, with a photo and email address. If we’re being picky, we could point to multiple CTAs. You could say there are too many emojis, but that could be part of the brand’s personality. There’s no unsubscribe link; you get that in later emails. Can you have too much of a good thing? We think you can, as this welcome email from Sean Platt’s and Johnny Truant’s Smarter Artist shows. It’s from a real person. It’s got lots of personality and humor. There’s tons of social proof in the form of links to successful products. It is way too long, though at least it’s not boring. The freebies people signed up for are near the end. People usually want the incentive immediately. There are too many links. 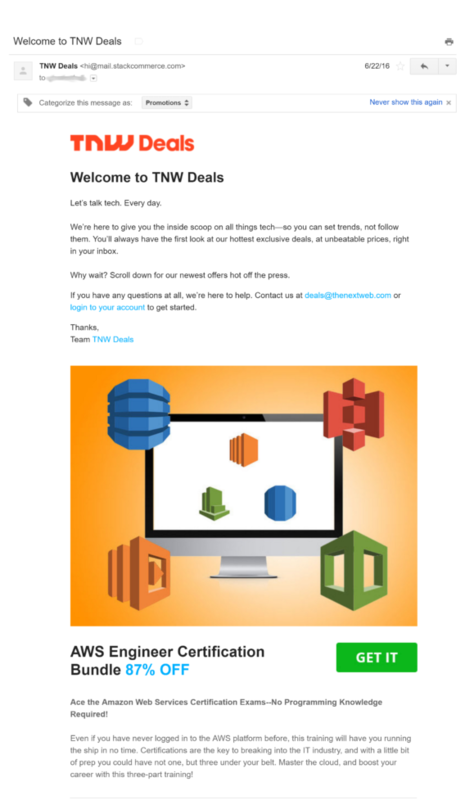 When you sign up for a deals email, you’ve got to expect people to try to sell to you, but does this email from TNW Deals go too far? The initial message is short and sweet. They deliver what people are asking for: deals, and lots of them. There are lots of images, which make it visually appealing. This is another very long email. It’s busy; there’s too much going on. The headline is appealing, showcasing the value right up front. There’s a single CTA, repeated twice. 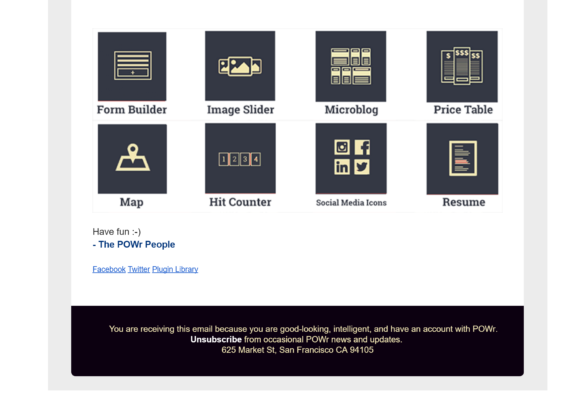 There’s an image showing what your page could look like. The unsubscribe link is clear. Social media icons are included. There was only one thing to dislike here. The email came from the team and not a person. 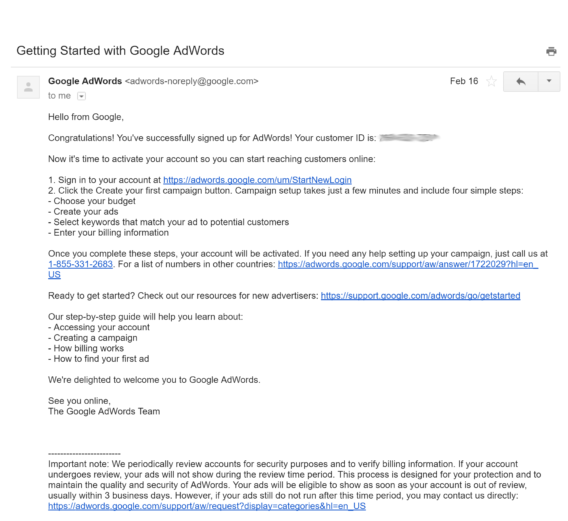 Sending more than one welcome email, like Adwords. Sending ridiculously long emails, like PostPlanner. Not being clear who’s sending the email. Failing to include trust factors like social media links. Don’t make them all about you; think about what the new subscriber needs. 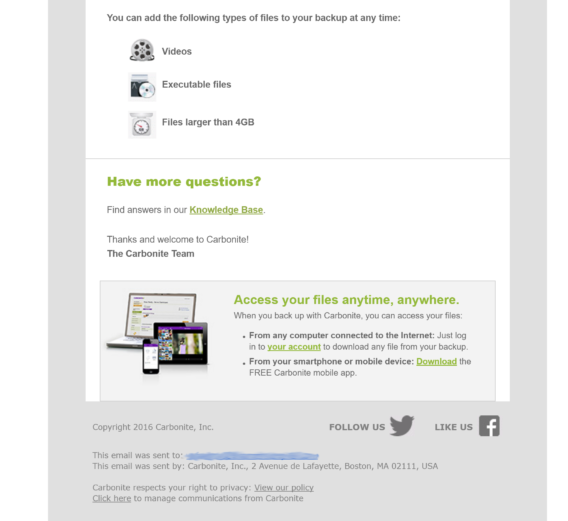 Though we didn’t see it in this roundup, some welcome emails include passwords in plain text. This seems to be an unnecessary security risk. By using the examples above, you can start to think about what kind of emails you want to send to your subscribers. After that, see our guide to email marketing for more help with your email marketing strategy. And don’t forget to follow us on Twitter and Facebook for more guides like this.